One of the very first projects that I did in the kitchen when we moved into our house, was redo the pantry. With five adults living in our house, we needed a lot of space for food, especially pantry items. The pantry that was in the kitchen was tall and deep, but it had a metal organizer installed in it that had wire baskets for you to put your canned goods, and boxed items in. While it was nice to have a wire organizer that pulled out for easier access, you can see that there was a lot of wasted space in the pantry, and we had too much stuff to fit in all the baskets. If you look at the counter on the right, you can see all the food boxes that were lined up waiting for a home. Plus, that green bin on the left also had pantry items in it! Using a regular screwdriver, I detached all the pieces for the metal organizer, removing all of the baskets and both the frame and the sliding tracks. This gave me a huge open space to work with. My plan was to add shelving, so I took measurements of how deep and how wide my pantry was and brought those measurements with me to Lowe's. I chose particle board from Lowe's that came in 2'x2' squares, and had the cutting associate in the lumber department cut them down to size for me. Since my kitchen cabinets are builder grade, they have pilot holes drilled along the front and back of the sides so that shelving can be added. I had checked on Lowe's website for the smallest available shelf pins and realized that my pilot holes were too small. I picked up a package of them anyways, knowing that I could always make my pilot holes larger. Don't forget that you will need four pins per shelf, so calculate according to how many shelves you will want in your pantry. When I got home, I used a drill and a 1/4" bit, and I made the pilot holes larger so that the shelf pins would fit. If you don't want to make every single hole bigger, you can choose to only do the ones where your shelves will be, but for ease of moving the shelves around later, I made all the pilot holes larger. If your holes end up jagged around the edges, just use some sandpaper to make it smoother. Vacuum up the mess when you are done, and don't forget to vacuum out each hole so that the shelf pins will fit in correctly. Once your pilot holes are the correct size, put in your shelf pins, and then place your pre-cut shelf boards on top of the pins. Last step - populate your pantry! This project made such a big difference, and took me less than an hour to complete! We now have so much more space to store pantry items, and things are even organized. Cans are on the top shelf, baking items and pasta on the second, crackers and bread on the third, chips and peanut butter on the fourth, and cereal, breakfast, and large quantity items are on the bottom. One of the best parts about this project was the price. 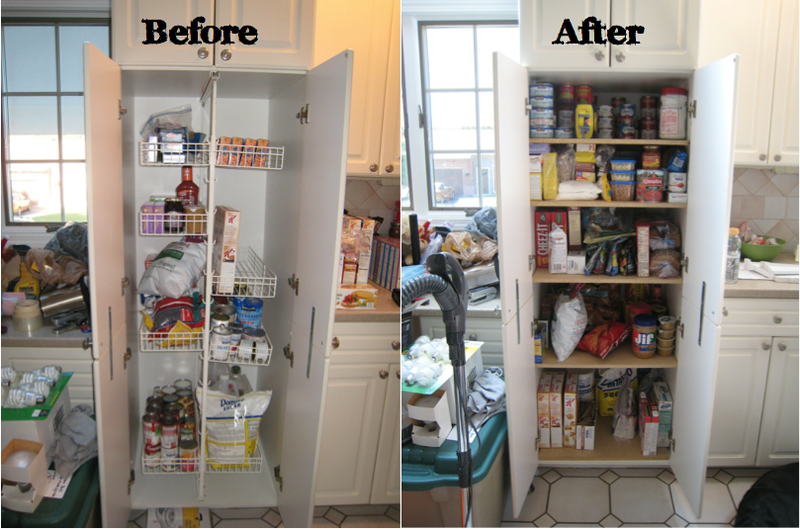 I was able to completely redo this pantry for under $40! Well worth it in my opinion, especially with five adults in this house and a lot of food! Have you redone your pantry? What kind of remodel did you do? Has this quick project inspired you to add shelves in your pantry?